I really have lost my blogging mojo. I have two draft posts in the wing but it was this unusual but wonderful cake that sprung me back to life. I have been a wee bit fascinated by turmeric cakes for quite a while. My first experience with turmeric cake was at our neighbour, Maria’s. She invited us for coffee and served small squares of yellow cake. The cake was yummy. I was intrigued by the cake and, as Maria is originally from Romania, thought it may be a Romanian recipe. I asked Maria what made it yellow. She said turmeric. I was doubly intrigued as I had heard of, but never tasted, turmeric cake. The next time I saw Maria, I asked her for the recipe but she was very dismissive and said she only added the turmeric for the colour. I am not sure this was true. I think she was just being modest. Late last year, I was browsing through the site, “Eat your books”. 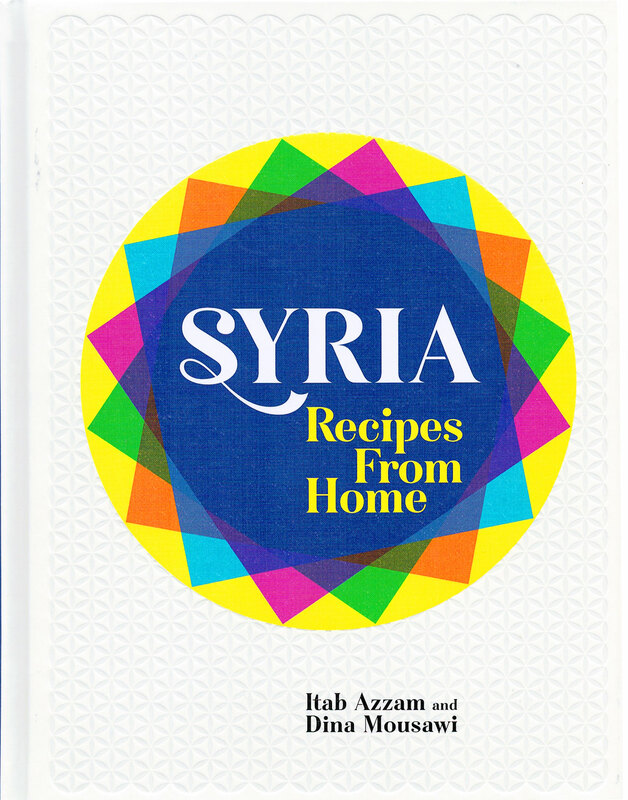 They had a give-a-way for Syria Recipes From Home by Itab Assam and Dina Mousawi. To be in the draw, you had to nominate what recipe you would try first from the book. Clearly, the strategy was to get you to check out the index and pique your interest in the book. I was already keen. I whizzed through the index and came to an abrupt halt at turmeric cake (Sfouf). Without doubt, this was going to be my answer. Of course, I didn’t win a copy of the book but later mentioned it to my mate, Colette, who instantly said, “Don’t buy it.” Hence, I was not too surprised to unwrap it on my birthday. It is a fab book. I am yet to make my way through it but, you guessed it, I have tried the turmeric cake. I have made it twice now. Geez, it’s good. It is my new fave cake. If you want to try something different, try this recipe. You will be hooked. This cake’s magic ingredient is nigella seeds. I have never seen nigella seeds in a cake before. Do not leave them out. They are what makes this cake so special. The first time I made it, I don’t think I cooked it quite enough and it sank in the middle. It still tasted good but wasn’t the prettiest. This time, I had guests coming and I didn’t want a sunken cake so I cooked it a bit more. Then I was worried it would be dry. I need not have worried. It was perfect, even though it still sank a wee bit. I am not sure what to do to solve this tendency. Heat your oven to 160°C and line a round 23cm spring form tin with baking paper. Line both the top and the sides. The first time, I didn’t line the sides and it did stick a bit. Add the eggs, one at a time, incorporating well after each egg. Pour the mixture into the tin and level with a spatula. Bake until a skewer inserted into the middle of the cake comes out clean, around 40-45 minutes. Whilst the cake is in the oven, make the sugar syrup. Add the sugar, lemon juice and water to a saucepan and stir until the sugar dissolves. Simmer very gently for 10 minutes. When the cake is ready, take it out of the oven. Insert holes in the cake with a skewer, concentrating on the outside edges of the cake. Spoon the syrup over the cake. When cooked, remove from the tin, sprinkle with icing sugar and pistachios. It would also look fab sprinkled with dried rose petals. 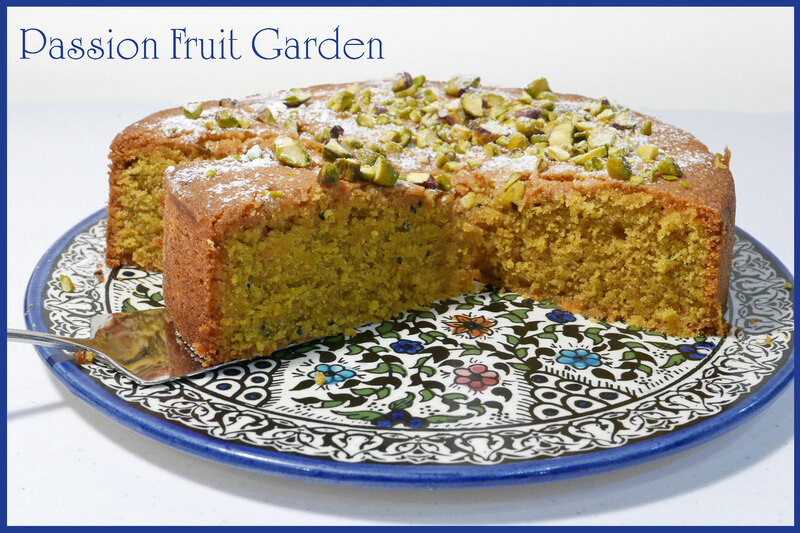 This entry was posted in Cakes, Sweet Things and tagged Middle Eastern cakes, Nigella seeds in a cake by Glenda. Bookmark the permalink. Hi Moya, it is fun to try something different. Sounds a rather large cake but if it’s good that doesn’t matter at all! A recipe to set aside to make on an autumn day when I want to faff around in the kitchen. It certainly sounds intriguing. Hi Anne, it really does taste “different”. Ooh this cake looks so pretty Glenda. And the ingredients are so interesting. I love turmeric and it clearly gives the cake a wonderful hue. Just a quick heads up tho I know you said your blogging mojo has left you – the IMK deadline is 28 May. Cheers sherry. Em. This recipe calls for turmeric powder. I will change post to make it clear.